Did you know you can try Solid Edge for yourself. A free 45 day trial of the software is available. Starting your registration here will also give you the added benefit of free access to a 25 minute on-line video tutorial to help kickstart your Solid Edge trial. I'm already registered what's next? Classroom training - but that's expensive and may not suit your schedule. Bespoke training - but that's even more expensive. A book on Solid Edge - but there are very few of these published and they're out of date almost immediately. Information from the internet - but you're unlikely to find any structured training from experts. Relying on the help files and tutorials within the software - but can you be sure you're using the software most effectively. Using any previous experience you or a colleague may have with Solid Edge - but can you be sure you've discovered the latest functionality. All, or any, of the above could help with your evaluation. However they all have certain limitations, especially when you have just 45 days to trial the software. There is another way, a better way. You can secure access to Solid Mastermind for 45 days to coincide with your trial and evaluation. 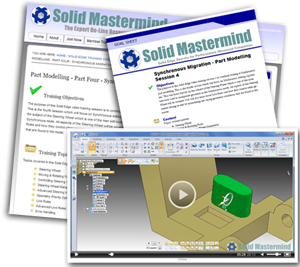 This will give you 24/7 access to expert on-line resources for Solid Edge including: hundreds of Solid Edge Tutorials, Tips & Tricks, Training Videos, and a huge archive of Solid Edge Questions & Answers and expert information and advice. Why not give your Solid Edge trial the best chance of success.